Sooner or later we are all faced with the desire or need to start over. 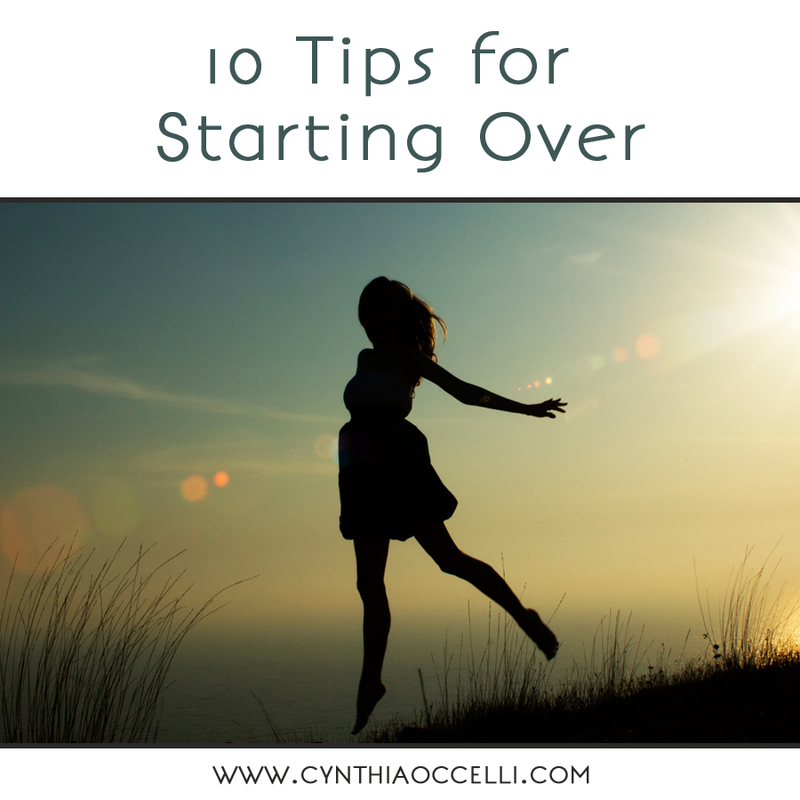 The following 10 tips for starting over will help you succeed. Accept where you are. In difficult or unwanted situations the greatest barrier to moving forward and creating positive change is resistance to what is. Accepting what is does not mean you have to embrace, approve of, or enjoy it. It means that you no longer turn it over and over in your mind or fantasize about how it could or should have turned out differently. Get to zero. Ideally, when you set out to create something new in your life you feel enthusiastic, confident, and motivated. Yet, if you’re emerging from a challenging situation (a loss, divorce, financial turmoil, broken heart, etc.) these feelings are often absent. It’s okay, you don’t need to feel positive to make positive changes, but you must let go of the past. Release regret, resentment, guilt, criticism, and any sense that you aren’t worthy of a great life. Holding on to the past while trying to move forward is tantamount to climbing a mountain with your hands tied behind your back; it’s starting at less than zero. Whatever happened is over, let it go. You did the best you could with what you knew and had. You are wiser now and history has no power over the future. Give yourself a fair start. Know that you aren’t alone. Nearly everyone I know who’s had to start over has expressed a sense of isolation. They feel completely alone and abnormal, as though they are the only person who feels the way they do. Some even feel that because of their misfortune, poor choices, or punishment from a higher power, they are enduring unique hardships. It’s never true. Life is rife with challenges and change, no one is immune. This isn’t obvious because we all wear social masks and attempt to conceal our pain, fears, sadness and disappointments. You are never alone in starting over or feeling afraid. Many have come before you and succeeded, they were made of the same stuff you are. Dream big. One of the greatest impediments to creating a new and desired reality is a small vision. Take some time and imagine your most magnificent life. Make it vibrant, vivid, sensual, and bigger than anything you’ve ever seen for yourself. Let go of any sense of I can’t, I’m not able, I’m not worthy, or it’s too late. The odds are irrelevant here. Also, big doesn’t have to mean complicated. It’s the difference between having enough to pay the bills and paying the bills while easily affording the perfect home and traveling the world in comfort, if that’s your real dream. The problem with dreaming small is that you signal your unconscious mind to work toward barely having enough and when you fall short (it happens) you place yourself under increased stress. Raise your ceilings and open up to having your unique version of everything. Tether yourself to this powerful image and let it lift you above the small dreams. Make a plan. Having a plan is vital for speeding up and solidifying your dreams. Even if you have no idea how to get where you want to go, make a plan. From the place of your big dreams manifested, imagine looking backward in time. Ask yourself: How did I get here? See what comes up. This information can be very helpful. I once had a goal of getting off of welfare and comfortably supporting myself and my son, getting an education, living in my favorite city, and being free to live the way I wanted. My plan was practical and inspired: put my son first, get a job with flexibility, create a side business assisting entrepreneurs who could only afford to pay an assistant a few hours a week, move in with a roommate temporarily, prepare myself to apply for school, save up enough money to move and believe that as long as I show up, a way will be made. Take daily action. Do something every single day to advance your goals. On busy days do something small (make a call, write a note, research, make a task list). Your dream is an energetic entity that lives on the energy you feed it. Feed it consistently and in time it will take on a life of its own. Small steps taken consistently over time create tremendous results. Be your best friend. Change can be intimidating and reaching into unknown territory can cause feelings of insecurity and fear. Making matters worse is the fact that if you talked to others the way you speak to yourself, you’d probably have no friends. The greatest undermining force is harmful self-talk. We all have an inner critic who tells us all the reasons why we shouldn’t take a risk and how terrible and/or inferior we are. Cast your critic in a new light. It’s a fear-driven old hag, lizard, cranky baby, or worry wart. Embrace it the way you would an ill relative. “Thank you for sharing, it’s going to be okay. You sit here and rest, I’ll handle this.” Pat it on the head and get on with being good to yourself. Tell yourself the truth: You are the most powerful person in your life. You are worthy of every good thing. When you help yourself, life will conspire to help you. You are enough. Make treating yourself kindly and gently a mandatory behavior. Get back up. We all fall. It’s a part of life. Failure only becomes real when life knocks us down and we don’t get back up. An old friend of mine says, “Success is one step past splat!” Fall 99 times get up 100. Persevere. Let the plan change. Remember my plan? My success didn’t happen that way at all. My life unfolded in a way that turned my plan upside down, I had to move before I found a job, I lived with my mom, and took a job that made opening my side business impossible for a year. Unanticipated opportunities arose; I learned new things and fell in love. Nothing went according to plan, but none of it would have happened if I hadn’t made a plan and taken consistent action toward my goals. Consistently pursuing our goals puts us on the path of opportunity and possibility. This is where the magic happens. Life really does conspire to help us when we help ourselves. Give yourself credit. It takes courage to start over and reach for a better life. Many people never even try. Their fear, insecurity, and lack of belief in their personal power hold them hostage, sometimes forever. Acknowledge, thank and appreciate yourself for being brave enough to try. At every step along the way, give yourself your love, support and recognition. Just what I need right now. I am closing my antique store after 7 years. I am excited and open to change but nervous too. Your post is just what I need. Nicki – I must confess, I don’t love change either. Even positive changes unsettle me sometimes. I rely heavily on my own writings and commit to practicing what I preach. It’s still not automatic, but it’s manageable. Life is so much better when we go “with” it rather than resist it. Best wishes to you and thank you for giving 7 years of service to lovers of antiques. Rose, I’m glad to have any role in easing or supporting you during challenging moments. Remember always, you are more than whatever you face. I am going to print this and put it up on the wall; or I may just write it directly ON the wall in big bold letters! Wonderful piece Cynthia – thank you. Will share. Deborah! I LOVE your comment. It’s so resolute that I feel motivated. Thank you. Nice, real work-for-you thoughts. Great and way to go for you! I am the bravest person i know..most people i know have buckled over less.My best friend says that she tells other friends that if my life was a book ,noone would believe so much terrible stuff could happen to one lovely person..This list has given me the nudge to start over again..shake off deadweight people who pull you down ! Thank you for these helpful words.Due to more than a few recent changes, I currently feel extremely fearful, vulnerable and sad. Finding myself here is a bit of a blessing, for sure. Kent, come read the nightly post I write on Facebook (www.facebook.com/lifeblog) It might help. Also, please take some actions in your community to reach out for help. You deserve to live free of fear and sadness. This is exactly what I needed to read today. Thank you! …and now you know, Cynthia, why I Love You So So much !! Thank you, this couldn’t have come at a better time. When I say I am ready, there is Fear standing right in front of me. I will read this page over and over again. Thanks love!! This was very helpful to me. This is most excellent REMINDER LIST to be re-read every time we fall and loose hope.